APRIL 2018 ....... URGENT Right of Way Issue ........ has anyone used the footpath at Baldwin's Omega Restaurant, Brincliffe Hill, Nether Edge, Sheffield? If so would you please fill in the evidence form attached PROW Claim form with map If you complete the claim form, would you please notify John Hawker on 07929 051978. 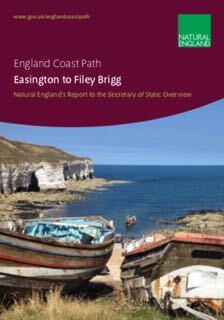 NEW - Easington to Filey Brigg Coastal Path Overview The Report is from Natural England to the Secretary of State. At Present there are significant gaps along the route (see page 23). 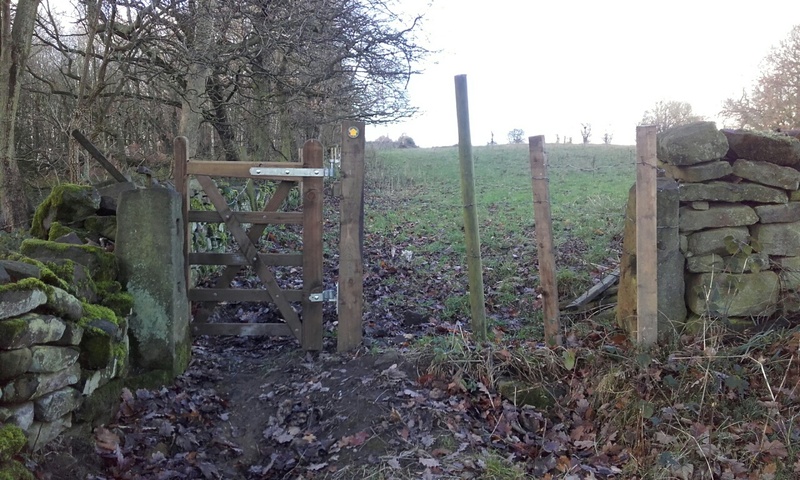 A minor PNFS success story on a footpath near Chesterfield - BEFORE and AFTER. NEW WHEELCHAIR FRIENDLY PATHWAYS - Path improvement at Moor Hall Reservoir near Stocksbridge/Bolsterstone. “All you need to do is ring or email the problem through to inf@transpenninetrail.org.uk and we will then relay the information to our project partners and record on our problem dbase. All reports are dealt with as soon as possible to enable urgent action to be taken if needed. Our partners and Group Coordinators are also issued with quarterly reports highlighting the outstanding issues that still needs attention, so it is essential that you continue to send through your reports. Major issues are also then discussed at our quarterly partner meetings. Issues of motorcycles, quads or 4x4’s should also be reported to 101, where you should also ask for an incident number to ensure the matter is also recorded on the police database. It is this evidence that is used by the police to potentially fund ‘sting’ operations to apprehend illegal users. Please also tell members of the public that they can also use this procedure to report issues on the Trail. If you have any further queries regarding this process, please get in touch. A new Pathwatch Launch by the Ramblers - They will be launching the Big Pathwatch report and their new Pathwatch campaign over the week of 14-20 November. “This will involve helping local authorities access different sources of funding, and showing how working across different teams within authorities can maximise the value of the network (e.g. how rights of way are a concern for health teams as well as highway teams). Bamford Parish Council object to the resurfacing with tarmac of Hurst Clough Lane, because of the historic importance of the existing centuries-old causey stones along much of the length of the Lane. This “Ancient Causeway” was part of the Roman Road from Navio Fort at Brough to Sheffield via Stanage Pole. 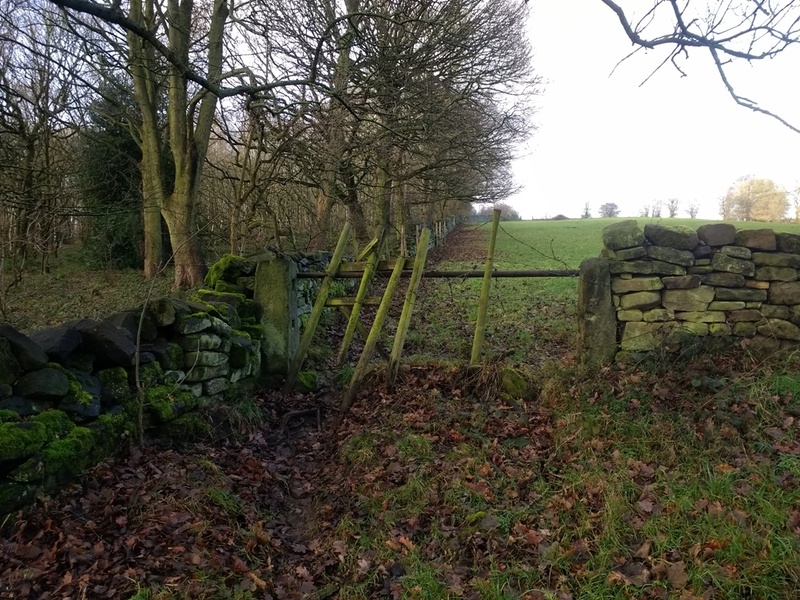 It has been drawn to my attention by a PNFS member that the section of footpath used by the Country Walk, running up/down the steep bank side off Moss Road byway down to the county boundary & Footpath No.1 in Sheffield, is not a definitive public footpath. This is probably an omission by the Parish Council under the 1949 legislation because of the location in a corner of the parish surrounded on 3 sides by Sheffield & the county boundary. I feel it would be sensible to claim this footpath whilst it is still open rather than risk a blockage & then have to start the rigmarole of submitting a Schedule 14 application to Derbyshire County Council. Its also useful because a number of people who have knowledge of the path & the creation of the SCW back in1986 are still around. I am sure we have all used this path over the years as part of a ramble without thinking about its legal status. Below are links to a user evidence UEF form taken from the DCC website, plus 2 plans at a scale of 1:25000 & 1:10000 to show the line of the claimed footpath. If you have used the path for any length of time, please consider completing the evidence form. If you prefer a paper copy, let me have your address & I will send one to you. If you have any questions about this matter, ring me on 07929 051978 or reply at this email address. If you know of others who could help, please pass this on to them. The more evidence we get the better. 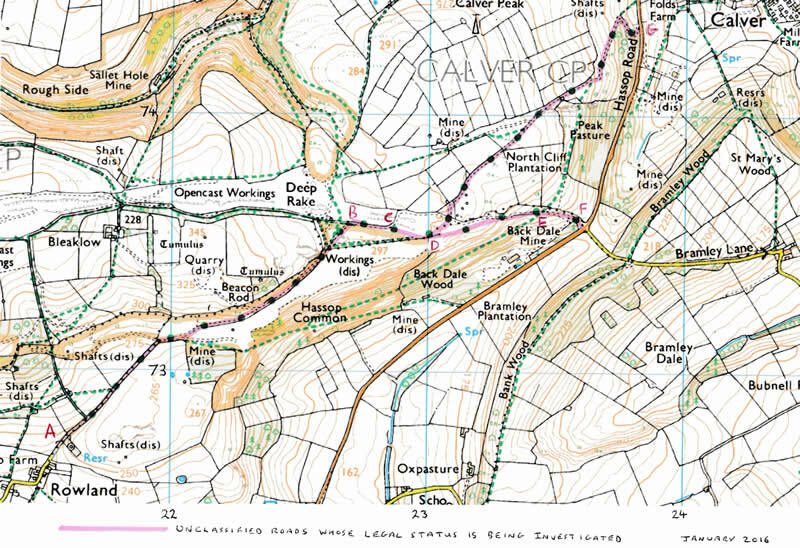 Derbyshire County Council is proposing to legally reclassify a number of routes which run south-west of Calver and which are currently recorded as unclassified roads (publicly maintainable but with uncertain legal status). These routes are shown on the map. 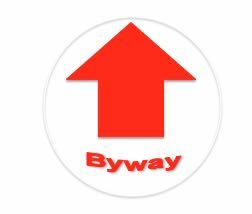 Three sections of the routes would be recorded as Byways Open to all Traffic (BOATs) (lettered on the map as A to B, B to C, and E to F), one section as Restricted Byway (C to E), and one section as Bridleway (D to G). The evidence that this the correct legal status of the routes comes mainly from historical documents, but evidence of use of the routes also plays a part. The fact that many walkers do not like the use of such routes by motor vehicles, including motor cycles, is irrelevant in this legal process, but if we can persuade the county council, or an Inspector at a public inquiry, that the routes should actually all be Restricted Byways (only public vehicular right in horses and carts), or Bridleways (no public vehicular rights), this would be welcomed by walkers. This is where evidence of use could be crucial, and we need your help with this. If you or your friends or family have used any of these routes on foot, horseback or cycle at any time, and preferably can remember when you used them (even approximately), then this could be very useful evidence. If so, please let me know at email: rhodabarnett@w3z.co.uk, giving your postal address, and I will see that you are sent user evidence forms to complete. 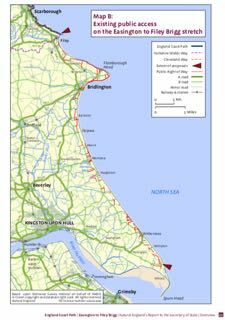 Meanwhile on behalf of the Society I will probably be objecting to the legal orders which designate sections of the routes to BOATs. It will be some considerable time before this matter is decided, but any user evidence which you have would be very gratefully received as soon as you are able to send it. LONG CAUSEWAY - From September 18th 2014 - Mechanically propelled vehicles to be prohibited at any time. In 2026 any path that’s not on the definitive map will be left off it. Forever! Local Ramblers Groups are now trying to ensure that all paths that should be recorded - ARE RECORDED. If you know of any paths that should be recorded, get in touch with your local Ramblers Group or contact SYNED - NOW. A new stile has been putin on Fallinge Edge at SK276662. This is potentially a very useful link. Thereis a path climbing up from Northwood which goes past Little Bumper Piece tojoin the Rowsley Bar Road at SK256659. 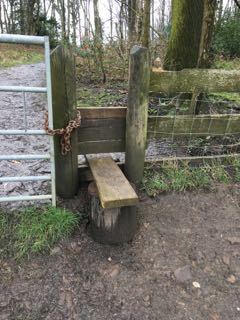 More or less directlyacross the road there is access to the moor and the new stile is 200 metres tothe North on the National Park Boundary. 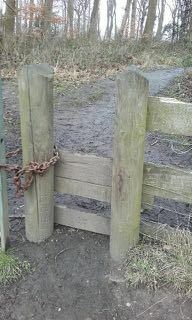 This gives access to Fallinge Edge andthe moor which stretches towards Beeley Moor. Be warned the walking isrough until a route is established by some feet on the ground. WHAT CAN ID DO ON A FOOTPATH! These lay out the form in which Orders must be made taking into account the recent changes in legislation which allow orders to divert or extinguish paths to be made if an application for planning permission has been made but not yet determined. From 1st October, you may get Public Path Orders using the new format. The Explanatory Notes are probably the best thing to read.